Famous American climate scientist Michael E. Mann on fight to save climate science, & his new paper: why extreme weather is more common. UK scientist Sarah Chadburn’s new look at fast thawing permafrost. Professor & journalist Marissa Landrigan’s new book: transitioning from vegetarianism back to meat. INTRODUCTION – WELCOME TO THIS PACKED SHOW! Dr. Micheal Mann has just testified to a House Committee, published an opinion piece in Time Magazine. He’s also the lead author in important new science that details how our greenhouse emissions have derailed the Jet Stream, leaving us with more extreme weather. Get ready. Droughts, floods, and fires are now part of “the new normal”. Almost a quarter of the land in the northern hemisphere is frozen. But this permafrost is thawing much faster than anyone thought possible. On our current course, almost half could be gone by the end of this century, re-arranging the landscape and emitting massive amounts of greenhouse gases. We talk with the lead author of the new study, Dr. Sarah Chadburn from the University of Leeds, UK. 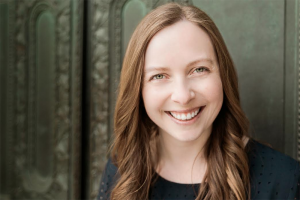 Professor Marissa Landrigan has been widely published in America. In her new book, she traces her relationships with food that lead to a surprising turn. Greens assume that a vegetarian diet is harm-free. But as we hear, in a factory farm system that isn’t true. From Montana to Ohio to Kansas, Landrigan morphs into “vegetarian-ish”. We hear about her new book, which stimulates a lot of questions for everyone who eats. Our first guest is the distinguished climatologist and geophysicist Dr. Michael E. Mann. He’s the Director of the Earth System Science Center at Pennsylvania State University. He’s the author of three books and the famous target of climate deniers for his early recognition of rapid global warming dubbed “the hockey stick graph”. On March 29th, 2017 Michael Mann testified to the House Committee on Science, Space, and Technology. He’s also the lead author of new science that shows how our weather has become more extreme due to greenhouse gas emissions. It’s very strange days when scientists have to battle “alternative truth” and out-right lies about climate change. The Republican-run House of Representative recently held another show trial, I mean “hearing” on climate change. Three of the four scientists invited are known to either doubt climate change science, or they minimize the expected impacts of creating a new climate. 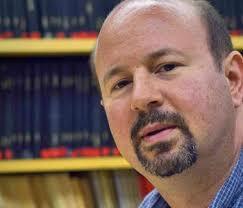 Michael Mann was the only scientist left to represent the 99% of climate scientists who rely on facts. I’d say these hearings are a joke if they did not represent the trappings of how fossil fuel interests have captured the American government. “Climate science today appears to be based more on exaggerations, personal agendas, and questionable predictions than on the scientific method. Those who engage in such actions do a disservice to the American people and to their own profession.” Lamar thinks “the debate should continue” – as though the few imposters and sell-outs who doubt climate science are equal to the vast amounts of international science that calls for action to reduce greenhouse gas emissions. Lamar Smith claimed that one of the oldest professional journals – “Science” – is not a professional and reliable source. Michael Mann had the duty to explain real science to dead-heads who are paid not to understand it. From that frustration, thousands of American scientists and their supporters are expected to march in Washington D.C. and other cities on April 22nd. If there is a march near you – please show up! We need policy based on real science, not “alternative facts”. There’s a lot at stake in our common future. As Mann tells us, it’s not just climate science being slashed by Trump. The national Institute for Health budget is being cut drastically. Who needs health anyway? Basically, the new Trump policy is a rejection of everything we gained in the Enlightenment. Let’s make sure we teach kids more about religion, and nothing about the science of how nature works. That slide backwards has already begun in some American states. The G7 of developed economies met in Italy in early Aprile. The Trump representative blocked a consensus statement supporting the Paris climate accords. The U.S. says they are still studying the issue. All of which, Mann tells us, shows how the “cancer” of American climate denial can spread out into the international arena. However, China is going ahead with their decarbonization program. America will be left behind technically. In his recent Time Magazine opinion piece, Dr. Mann offered some words of hope. It was titled “The Single Shining Hope to Stop Climate Change” as published April 8th. Calling fossil fuels an antiquated technology, like whale oil, Mann points out that alternative energy is growing even without subsidies or a price on carbon. The fossil fuel companies get to pollute the atmosphere for free, and they still can’t compete. Here is the title of the paper published in Nature on March 27, 2017: “Influence of Anthropogenic Climate Change on Planetary Wave Resonance and Extreme Weather Events”. This is another huge paper, and a step forward for science. We’ve all watched incredible weather extremes on TV. Here are some that come to mind: the European heat wave that killed at least 50,000 people in 2003, the Russian killer heat wave in 2010 and Pakistan flooding in the same year. Hurricane Sandy flooded New York City. There’s lots more. Is there a link between these extreme weather events and climate change, and can we prove it? This new study says “yes”. I won’t go into all the science (and I’m not qualified to do so). My nutshell impression is as follows. We already know from the work of Jennifer Francis at Rutgers that the decline in Arctic Sea ice, and northern snow, has altered the course of those high upper winds known as the Jet Stream. The Jet Stream has become slower, with large bends that meander further south. That affects the weather. This new paper shows how very large unseen atmospheric patterns called “Rossby Waves” are now acting like “atmospheric guides” that can encourage the Jet Stream to stall in a holding pattern. So if the weather being held over is hot and dry, there may be unusual fires. If a heavily laden storm is stalled, then we get flooding. Think of it. “Normally” a big rainstorm would hit and move on. Now it seems to linger for days, dropping record rainfall in one area. This paper shows that is due to changes in the climate, and those changes are definitely from human-made greenhouse gas emissions. The results are in: humans have changed the weather. This science is not yet at a point where we can directly predict the next weather extreme. That would be so helpful for weather forecasters and governments who plan emergency response. But Michael Mann tells us we are getting closer to those capabilities. Here are some links you can use to find out more. Need something to convince people climate change is real. Consider this book. Publisher’s Book Description: The award winning climate scientist Michael E. Mann and the Pulitzer Prize-winning political cartoonist Tom Toles have fought at the front lines of climate denialism for most of their careers. Michael just tweeted that the web page for this book has been up-dated, with new videos added. In our interview, I suggested this book would be perfect for President Trump. Of course he wouldn’t read it (he seldom reads) but he would get the cartoons! Here is Michael on Science Friday “Conveying Science Across Partisan Lines” 17 minutes re his appearance at the House Committee on Science, Space, and Technology. Or check out this dialog on MTV between Michael and John Cook, host of Skeptical Science: “What will happen if this administration ignores climate change“. Here’s a good piece in the Guardian by John Abraham, published April 7, 2017, about the new science paper: “New study links carbon pollution to extreme weather“. And finally Science Daily wrote about the new Mann-led science on March 27th, based on information from Penn State. The paper published in the journal Nature Climate change was published on April 10, 2017. The title is: “An observation-based constraint on permafrost loss as a function of global warming”. I’m hearing two streams of worry from scientists and people in the North. The first is about clogging northern rivers and coastlines with thawed muck from ages past. The whole landscape can sag, rise, or become very unstable. Global warming is driving geologic-scale change in the north, all around the world. The second concern is about even more greenhouse gases flowing out of the permafrost. Vegetation from long ages past has become frozen, like frozen veggies in your freezer. When this vegetative material thaws, it rots, breaks down into carbon dioxide (if exposed to air) or methane (if under water). There is far more carbon stored in the permafrost than is found in our atmosphere. Sarah told us that if we continue on our current path, up to 48% of permafrost could thaw! That would be an astounding change. Buildings on permafrost would heave, roads buckle, pipelines break (more spills), trees fall over, and rivers can even be diverted by shifting land, as just happened in Canada’s Yukon. Of course those greenhouse gases released by rotting permafrost becomes a positive feedback loop. More emissions, leads to more heat, which leads to faster thaw, which leads to even more emissions. Other scientists on the show have indicated that once the process begins, emissions from the far north could become greater than human greenhouse emissions. At that point, it’s too late for us to completely shift to alternative energy, or collapse, or whatever. Nature takes over. We humans have added almost 1.5 degrees already. 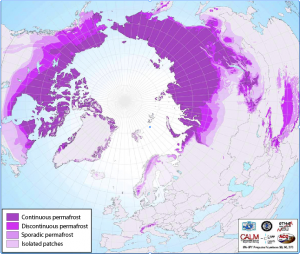 It sounds like permafrost decay alone could equal or exceed all human emissions to date. I looked into Joe’s use of another paper, and found that he quoted the very upper limit of possible warming. The science also says warming by permafrost might be lower than 1.5 degrees F. We don’t know. There’s no analog event in the past to compare with the rapidity of human climate change. Sarah thinks the number would be lower than 1.5 degrees F.
The 1.5 degree warming from permafrost melt appears to be the upper limit from this paper: “Significant contribution to climate warming from the permafrost carbon feedback” Andrew H. MacDougall et al in Nature Geoscience September 9 2012. Sarah has mastered one of the four big climate models run by the UK Met Office. One model is for the sea, but Sarah uses the land module – that’s where the permafrost is. This climate system is called the Jules Model. It’s available to other researchers with no fee. This adds more possibilities for collaborative research. Given our dire climate predicament, I think we need all our best minds linked up when they want to be. It was a struggle of some years to get model simulations to accurately reflect what was measured in the field. Sarah was among those who tweaked a publicly available model, the Jules Land Surface Model. This new paper from Sarah’s group is not based completely on modeling. The scientists cross-checked model results against a wide range of actual measurements in various northern countries. Here is another alarming aspect. None of the warming estimates from thawing permafrost are in the latest reports by the Intergovernmental Panel on Climate Change. When politicians are advised by experts from the IPCC (for those politicians who still believe in science) – the leaders are not getting the full picture left. A few very serious feedbacks are happening, but not yet incorporated in the models for various reasons. So the results are bound to be “low-balling” what will actually happen. Permafrost research is going on all around the world. It’s fascinating stuff. One study by Canadian scientists showed the thaw is revealing the outlines of an ancient glacier. Does the sub-soil have a memory? My permafrost research also took me to the Lena River, one of the world’s ten largest rivers. It snakes through Siberia to the Arctic Sea. How will these great rivers be affected by the permafrost thaw? Almost a quarter of the Northern Hemisphere is still frozen. We are all worried about a possible mass release of carbon dioxide and methane from thawing permafrost. But I ran across a scientist who reportedly reduces that concern. Suzanne Tank is a scientist at the University of Alberta in Canada. She told a reporter from InsideClimate News that the majority of carbon from the Canadian thaw is released as coarse particles that do not convert to CO2 right away. Should we worry less? Not really, says Sarah. The carbon emissions may be delayed, but they will happen. During my research I did find a Scandinavia paper showing that carbon-laden particles coming down northern rivers IS converted in the Arctic Sea into atmospheric carbon. Find the Swedish study description here. Given the very rapid warming of the Arctic, I’d like to see a multinational “war room” for models, observation, and a database of solutions, or at least ways for humans and other creatures to adapt. Given the threat, are we doing enough? At the annual meeting of the American Academy for the Advancement of Science in Vancouver 2012, I recorded a workshop of permafrost scientists. One older Canadian scientist, well-known in the field for his decades of patient measurements, still felt the science of permafrost would not be relevant until later this century. It’s a very slow process he said. Now, just five years later, what do you think? It’s hard for most of us to imagine what is happening in the formerly permanently frozen lands of the North, unless you’ve been there. The maps are huge, the calculations are huge – maybe this whole process is still beyond our grasp. But whether we know it or not, as this new science shows us, the permafrost is thawing much too fast. Food can be about security, guilt, climate, the future we choose, and who we are. And just when we know the green goal of food correctness, I get this head-bender in the mail: “The Vegetarian’s Guide to Eating Meat – a Young Woman’s Search for Ethical Food”. The author is Professor Marissa Landrigan from the University of Pittsburgh. She’s an engaging American writer whose essays appear in the The Atlantic, Salon, Guernica, and Orion magazines. One phrase from Marissa’s book echoes in my mind, because it applies to so many things. Meat brought her an awareness of “an enormous amount of suffering that happened behind closed doors.” That could apply to so many things. In her own words, Marissa grew up among “white upper class kids in shaved heads” talking about revolution. Vegetarianism fit into that mix. But as a 20-something in Washington D.C., working for the Wilderness Society, – her vegetarian diet was actually pretty awful. Marissa tells us about that. And then how her vegetarian diet worked in meaty Bozeman Montana. She arrived in the California, the land of food plenty, only to discover that “47 percent of adults in Ventura County live in food insecure households.” How is that possible? As with many, the seminal book “The Omnivore’s Dilemma” by Michael Pollan changed her life. But now, for reasons well-explained in this book, Landrigan drifted back to “some” meat, perhaps calling it “vegetarian-ish”. Landrigan’s newest work goes against the greenstream. It’s called “The Vegetarian’s Guide to Eating Meat” from Greystone Books. We are out of time, in more ways than one. Don’t forget to support the march for science on Earth Day, April 22nd. Thank you for listening, and please tune in again next week for more Radio Ecoshock. If you can help support this program, my “sponsors” are donating $10 a month. That, plus a few generous donors, is what keep this program coming out free for all, every week. Please check out these options. Okay, I love that you do these shows Alex… but PLEASE get someone on here who will bring this stuff up…. Truthfully, I do not have any hope we will persist much longer on this planet… but… I really do not appreciate these scientists who say all but what is really needed to be said…. energy efficiency be damned if we are still allowing 1,000 private jets to go to one football game….